Located some 32 kilometres from Wiang Kaen District, this scenic mountain is the home of Chinese, Hmong and Yao ethnic minorities. From the hilltop, visitors can enjoy panoramic views of Thai and Lao rural areas. The mountain is more popular during winter when the cherries blossom and a sea of mist cover the whole area. 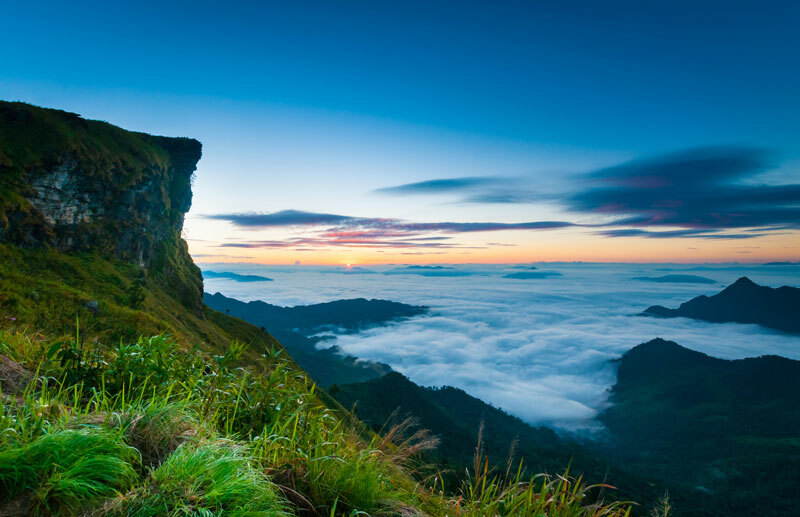 Phu Chi Fa is 1,628 metres above average sea level. In the cool season, the landscape is so charming. Several kinds of wild flowers are in full bloom, especially Nang Phaya Suakhrong or Thai sakura (Prunus cerasoides D.Don) which will welcome you with its prolific charming pink flowers. Another factor making Phu Chi Fa attractive is its appearance. Its top shapes like a finger pointing to the sky and this is why the mountain is called "Phu Chi Fa" (the mountain pointing to the sky). When on the mountain top, you can absorb the beauty of the fluffy mist that seems to embrace you and the mountain. Besides the mist, travellers to Phu Chi Fa will love the white bauhinias (Bauhinia variegata Linn.) which bloom from February to March, painting the forests with its white colour. To get there : From Chiang Rai city, use Chiang Rai-Thoeng Route (64 km) and then turn onto Thoeng-Pang Kha Route (24 km). Then there is a laterite road leading to Phu Chi Fa (19 km). For more information, please contact Phu Chi Fa Forest Park Po District, Wiangkaen County, Chiang Rai, Tel: 0 5371 4914 Fax: 0 5371 1961.